This is my painting table at the moment. It is in chaos! Obviously I've got several projects on the go. Lets see how many! The first thing marked is my US mortar platoon. I needed to paint this for the WWPD D-Day campaign so that I didn't have to rely on my para mortars as proxies. I only did the gun teams themselves as I have a lot of command teams (20, I think!). The platoon is all finished and awaiting a matte varnish. 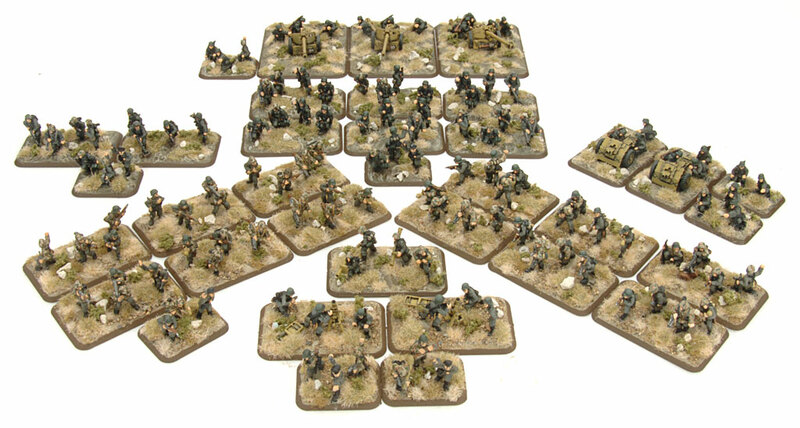 This platoon has been undercoated for a couple of years since the release of US801 SMG Platoon.With the campaign in full swing, and a serious lack of medium bases for my US Rifles, I decided to paint these up. They will serve as 'riflemen' in the event I need to fill out my two existing under-strength rifle platoons. This is somewhat essential to complete before I can meet Patrick on the field of battle in the US sector. No idea how these jumped into the queue, except I suddenly had the urge to paint them. Perhaps it was all of the built up suspense for starting the WWPD campaign, or maybe it had something to do with Warsaw. Dunno. At any rate, these are a piece of cake to do, and I've got a couple to do up with some loaders (for Warsaw). I did these up several years ago for the event Panzerschreck down Palmerston North (on this weekend, incidentally). They are pained up in a Feb/March 1945 scheme with disappearing whitewash. As I was working on my Germans, touching up some battle damage, I saw these could use some attention. I've always enjoyed this army and should really get it out more often. 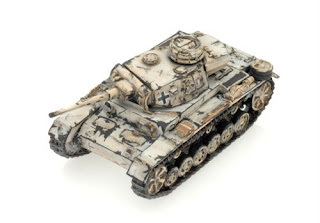 I did these as a support option for my Schwere Panzer Kompanie above. It was an understrength platoon, and it was a silly add. But if I recall correctly it actually did a good job acquitting itself. This was the fourth and final platoon in my Schwere Panzer Kompanie (HQ and 2iC PzVIb, 1x Pz VIb, 1x Pz VIb, Gep. PzPio, and SPAA). As I recall they actually carved up a Razvedki platoon! I must get these back on the table one day! It's winter here so I'm in a winter-forces mood. I did this trial T-34/85 to see if I like the results. I used the same technique with my MW Panzer III army. I think it turns out pretty good. 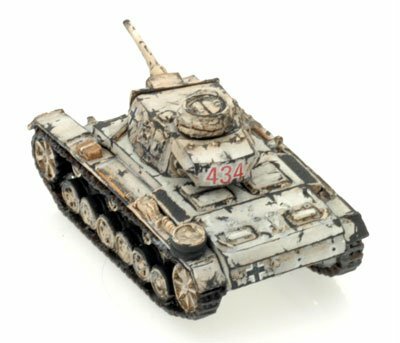 I'll likely finish this T-34 box of 5 tanks in this style as a support option for yet another Soviet infantry company I've been wanting to do. Ultimately, though these whitewashed tanks won't be a part of this army, I'd like to do a 756th Rifle Regiment based in rubble for their assault on the Reichstag! 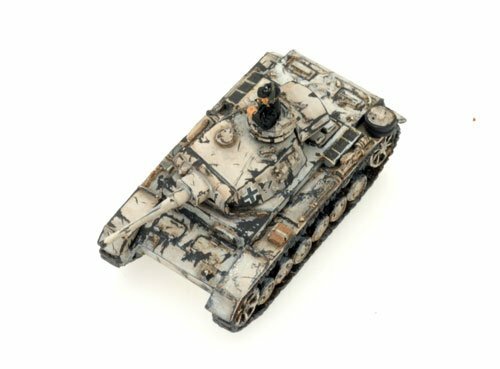 This got added to my table when I emptied the box it was in to take some M4A1 Shermans into work as a part of an 82nd Airborne Parachute Rifle Company I intend to use against Chris's Beutepanzers next week. Now that I have them on the desk, I may get around to painting the platoon. It would be my third platoon for the force. This is an objective I'm going to touch up for my current Soviet army. It took some damage to the gun barrel and now it kinda looks like a Dr Seuss T-34. 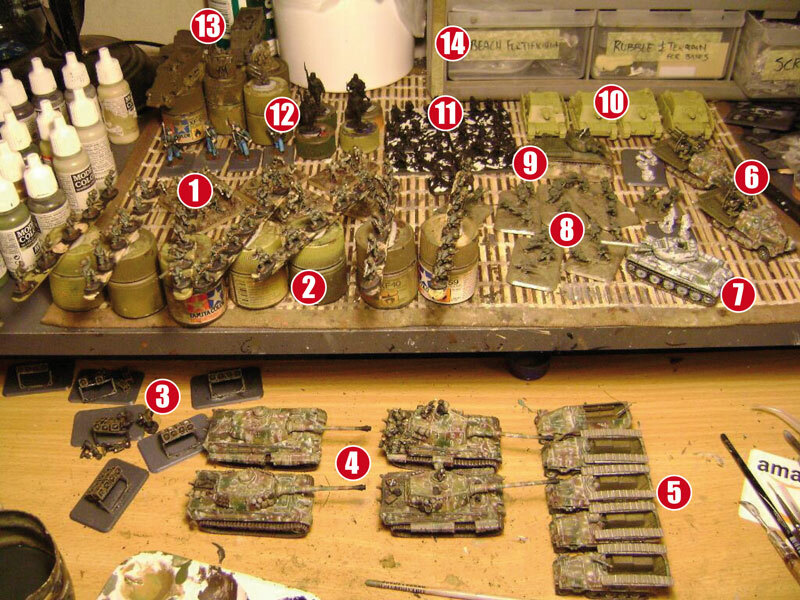 I based these up and "primed" them back when I was working on Stalin's Onslaught, 6 years ago. I think they need to be finished! They are my third platoon and I've not needed them, except now I need a third platoon for my Fusilierkompanie. 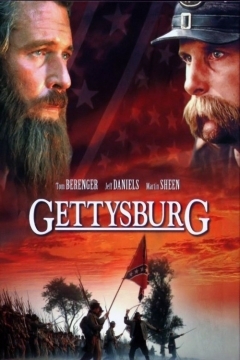 I've got some forward motion on my Muskets & Tomahawk mod for the American Civil War, thanks to a viewing of Gettysburg (fair warning, its 4 and a half hours long) in celebration of the battle's 150th anniversary this past 1-3 July. My plan is to do two identical armies using the Americans from M&T. Nothing flash or exciting in terms of special rule modifications. I reckon I need to understand the game before I make any changes. 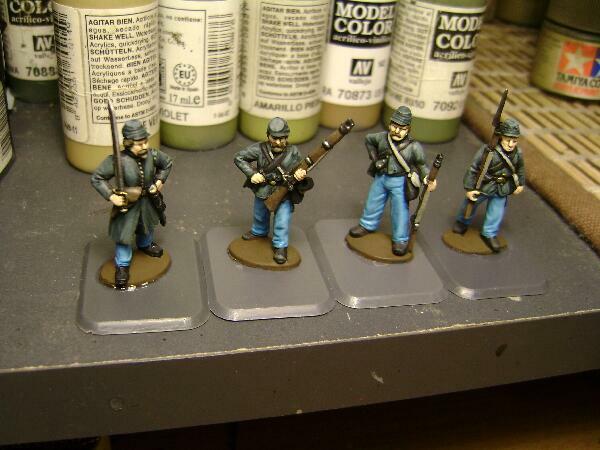 Incidentally I picked up a box of plastic British soldiers for American War of Independence from Perry Miniatures. That, combined with my Northstar Woodland Indians, should set me up with two forces for proper M&T. I've based them on FOW small bases because I have a million of them. I've got this platoon in my US Rifle Company. I thought 'why not?' and added it to the force. The trouble arose when I realized that I only have one M15 and two M16 half-tracks, so I need to drum up the fourth vehicle. So that's on hold until that happens. This drawer tempts me every time I sit down at the painting table. I want to do some for a beach landing. I totally missed my opportunity to get a landing in for the WWPD campaign, and now this drawer reminds me of that! Still, I have a beach mat and I'm pretty sure I can talk Pat into a Utah or Omaha landing pretty easily! Ok, thats the rundown on the table of mystery. Now, I just need to clear a few of those off! Wow, that is a lot of stuff to get done. Did you put your 8 Marder III Ms for a Fusilierkompanie on the back burner? Really like that King Tiger pic, ace work. I'll be taking a pair along to CTA in August, hope they do as well as yours appeared to have! You doing Panzerschrek this year? Nah, can't make it down this year, unfortunately. Next year, I've got no excuses and I've already booked the time in with the misses! Good luck with your KTs at CTA! How did you paint #7? They look exceptional.